Starting with a salty Armenian yoghurt drink – the Ayran – and a couple of beers, we were given a basket of pita bread and bowl of house made hummus drizzled with olive oil and full of chunks of chickpeas. So fresh and creamy, the dip was gone in minutes. Next came the classic vine leaves, stuffed with rice, minced meat and onions. Each bite was packed in with flavor unlike anything else. Then the much anticipated kebbe naye– my favorite dish of the evening. 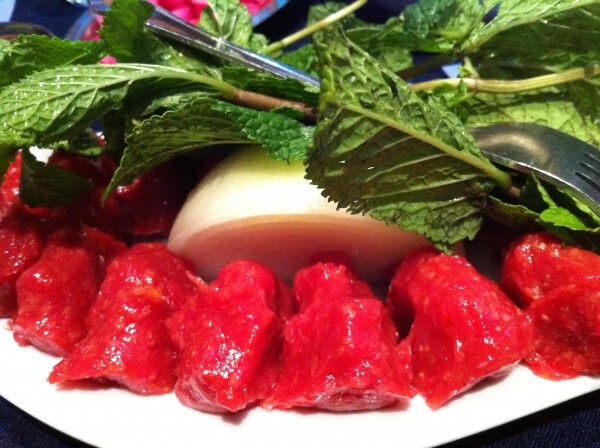 Hand shaped into small ovals, the raw meat was accompanied by some half onions and several sprigs of mint leaves. While it may seem unclear as to how to approach the dish, the way I go about it is to break off a piece of onion, grab a few mint leaves and layer on the meat, topping it off with a touch of olive oil. And you’re done! Delicious stuff. The meat has a particular texture: with cracked wheat and a variety of seasonings mixed in, each bite is more crunchy and textured than your regular tartare, which I absolutely love. All of the dishes were ordered to share and with this last one – the trio mix – it turned out to be just the right amount. Coming with three chicken brochettes, three kafta brochettes, three filet mignons brochettes and some pita with hot pepper sauce and biwoise salad, all the meat speared onto the brochettes was perfectly cooked, juicy, moist and tender. We scraped our plates clean and sat ready for dessert. The only sweet on the menu was baklava. While the dessert may not be original in the sense that most people have tried it before and that baklava ranges across a number of Mediterranean and Middle Eastern cuisines (so not exclusive to Armenian cuisine), the baklava served here was surprisingly delicious and original in its own right. Tasting incredibly fresh, it seemed as if the dessert was made very recently. The flakiness of the pastry and its many layers made us crave for more than what was on the plate, further sweetened by the clear sugar sauce. Tags: Armenian, Ayran, Baklava, Beer, Brochettes, Chicken, Cracked Wheat, Dinner, Filet Mignon, Hummus, Kafta, Karoun, Kebbe Naye, Lebanese, Lunch, Middle Eastern, Mint Leaves, Olive Oil, Onion, Raw Meat, Salty Yoghurt, Sausage, Yoghurt. thank you for sharing this! this place is now on my list.